I can’t necessarily say that I live an exciting life. I can say I live a somewhat busy life. I wanted so badly to sleep Thursday morning, to stay in bed until the urge for coffee overwhelmed the need to lay prone. It may be my own fault – I’ve started reading at night [summer project] and it can be difficult to put a book down when it’s time to go to bed. The first of three on my reading list: The Rise of Christianity by Rodney Stark was recommended by one of my Pastors; Hard to Die by Andra Watkins is the second in her series (the first is To Live Forever) that winds history and fiction in a definite page-turner; and Motherland by G.D. Abson, a find through Twitter and a fellow blogger. One book down, two to go, then on to the growing list of recommendations from friends. I’m trying to keep my hands off John Sanford’s books because that’s all I had been reading. 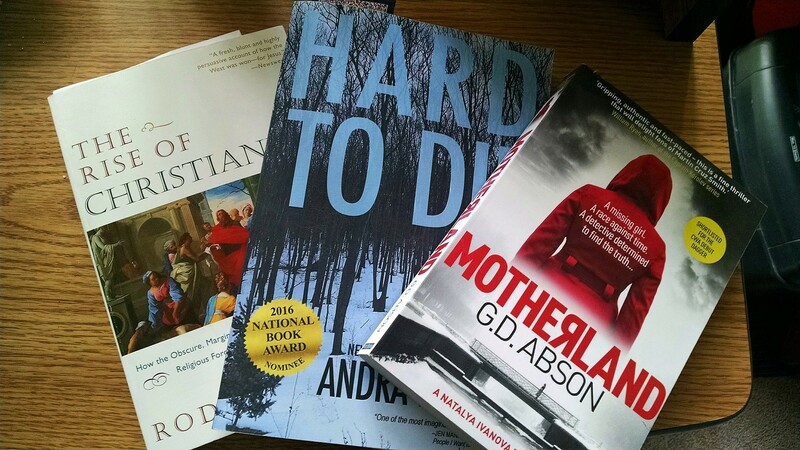 Excellent murder mysteries, but there is such a thing as broadening one’s horizons by reading different authors and genres. If you have any good suggestions for authors and their books, make sure you leave them in the comments. The trails have been calling to the orange Kona and I’ve been helping her answer. The weather has improved, so the baby and I go out on the paved trails when the temps are decent, the sun is out and the wind is not whistling at 20 mph. The state and local trails that are mostly gravel or hardened earth are off limits until it dries up around here. Incessant rains had caused water levels to rise in rivers and lakes and there were flood warnings in some areas of the state. The shore at Fritse Park usually goes out to the large tree on the left. 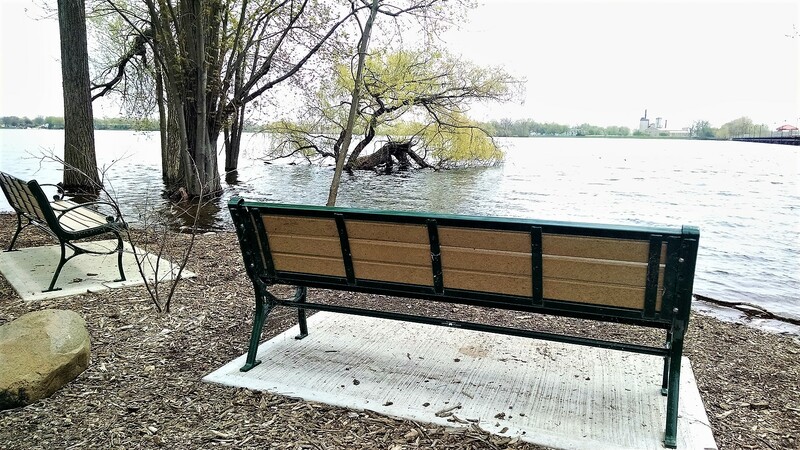 If the incessant rains return, these benches could be under water. I stayed busy last weekend with a home project. The cat tree that shed all over the bedroom with carpet fibers is gone. A carpeted window shelf took its place. 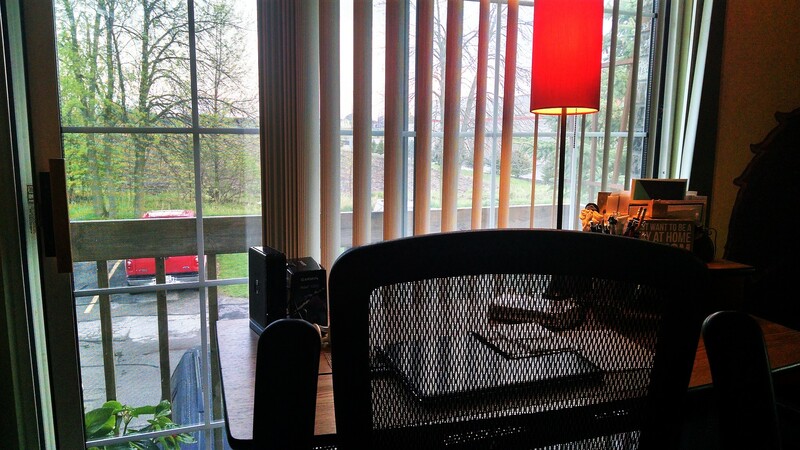 Then I moved all of the furniture around so that my office area has a window view. 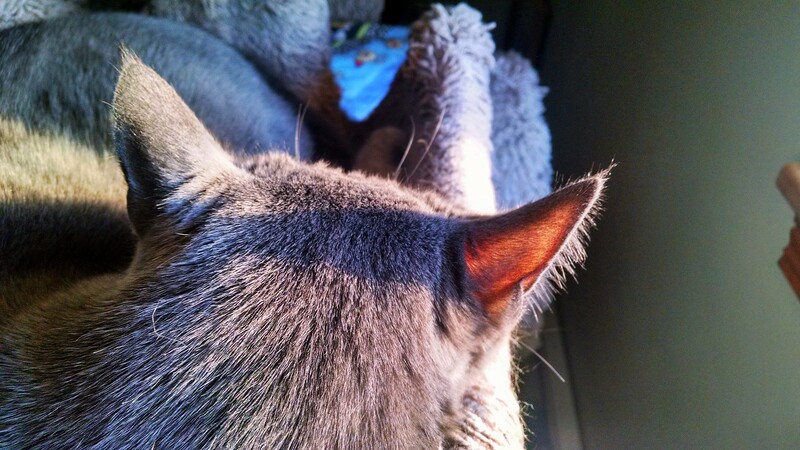 I can see green grass and trees and the side of Costco while writing posts. The bedroom project took longer than I expected. All day. When furniture is moved that hasn’t been moved in four years, there’s some cleaning to be done. I’m not going to mention what had to be cleaned for fear of embarrassment, but I will tell you that the Raggedy Ann doll that sits on the pouting chair is still naked, waiting for me to wash her dusty dress and bloomers. These two were also busy. Mr. Turkey enjoyed looking at himself (or was it another turkey?) in a glass door at work. He used an employee’s vehicle to get a better vantage point, but decided to leave when we ran to get our cell phones for a photo op. I also noticed, while walking the trestle bridge at Fritse Park, that the pelicans have returned to Wisconsin. I love that they have chosen this place as their summer home. This past Sunday was Mother’s Day. I had dinner with mom and a fairly nice visit…except when she told me not to smile because it was bothering her. Well, okay then! Something was in the air. One resident started swearing loudly and another threw her half of a baked potato across the room. I stayed for a couple of hours, not smiling, sharing a few words here and there, watching for flying objects and having a piece of cake with mom. Finally, there’s the task of walking and soaking up spring’s arrival. I took a Monday off (mental health day) a couple of weeks ago and spent some time in the Appleton flats, maneuvering around curves, past railroad tracks, and following the path of the Fox River. I took these photos before the trees and grass truly came alive. It’s much greener now and it definitely smells like mid May. That’s it for the somewhat busy post, although the busy is not done. I have more to do this weekend, like taking the cat-furry quilt to the laundromat and checking out flower possibilities at the greenhouse. Always so much to do and never enough time. How has your somewhat busy been? Been keeping up with life? The busy of spring! It’s a different busy, different energy … all of it good. It’s been outright miraculous how the world has exploded in green and flowery colour in just a few short days. I’m sure the Kona will be itching for many more excursions! I’m scoping out the weather for Saturday and Sunday…for another bike ride. I’m also planning a little trip to see a friend in upper Michigan (on the shores of Lake Superior) and hit a few bike trails while I’m there. It will be a good excursion as long as there is sun and dry air! It’s supposed to rain here Saturday night and cooler on Sunday, so I may have to work at that ride tomorrow. I’m trying to work on those bike legs so it’s not agony when I finally decide to ride to work. How far is your ride to work? If that had been an option for me, I would have leaped at it! It’s only five miles one way, so pretty easy peasy under normal circumstances. Since my foot thing occurred last year, my exercise habits have been less than exemplary…so I’m trying to get back in shape without hurting myself. I rode 11 miles last weekend and was pooped by the time I got home. Weenie! That’s a busy week! 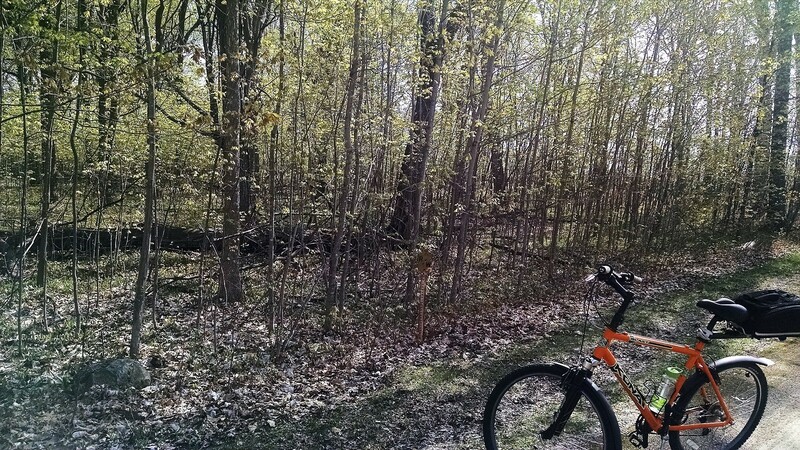 I love to see that you’ve hit the paths with your bike and are enjoying the spring weather! Finally, it has arrived! Happy Spring to you! We have to enjoy spring around here as much as possible because the warm weather always goes by so fast. I hope you also get out and enjoy the scenery up north. It must be so pretty with the trees the color of spring green. Love it! I think it feels good to be busy in the spring, but I think you might be setting a record. Of course I like the view from the flooded park, and I Iike the fact that you’ve been out on your bike. I also really like the photos, especially the one of the tracks and the turkey. We’re going to have rain this weekend, but I think I’m going to be busy. The busy might be around for a while. My own fault, really. I want to do too much all the time, especially in the warmer weather. Winter hibernation is over! I hope the weather holds for yo to pack as much in as possible. I have a busy summer, but maybe a little less busy – you know, under capacity – for a while. I’m glad the home project is over! I have been hellabusy for two weeks and while there are two more weeks of school, THEY have somehow crammed everything left into this week. The last week will have stuff, but not like this week coming and the one we just had. I have two Raggedy Anns who sit in my entryway, and I pick em up and shake em pretty regularly. Now and again, I throw em in the dryer, but I’m afraid to wash em, because handmade. Are ya gonna wash the clothes by hand? Let me know how it goes? I’m sorry your mom didn’t want you to smile all day. That sounds painful, fighting back smiles. Still, I’m glad you had the time with her, and cake. Glad you got some time on the bike, too! I hope you get through your busy week without any issues. Just keep going and it will be Friday before you know it. I hand-washed the clothes in a mild detergent. The dark dress didn’t fade, but the water was the color of something I hadn’t washed in a while. The white bloomers and apron also came out well, but wrinkly. Since I hate ironing, Ann will have to be grateful that she has her clothes back on.